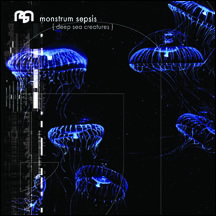 Monstrum Sepsis emerges from the depths to bring you a new full length album of exquisitely inspired and arranged electronic music. Written and composed by Rob Wentz with additional instrumentation from Paul Karlik and guest vocals from Shikhee of Android Lust. Originally limited to 300 copies this new pressing features a few artwork enhancements as well as two new tracks. These 12 tracks will lift you off your feet in a sonic array of pulsing synthetics, disruptive modulations, sweeping strings and incredibly infectious rhythms.